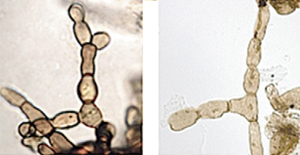 When these hyphae branch and intertwine, they may form resting structures known as sclerotia. 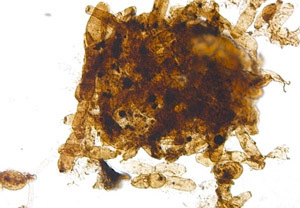 Sclerotia of modern soil-borne fungi such as Rhizoctonia look nearly identical to the disc-shaped structures found among the Reduviasporonites microfossils. Sclerotia are energy storage structures that can help fungi survive extreme conditions.